I am obsessed with our local library's online system. These last several weeks I have been utilizing our library more, and my wallet less, to soothe my restless reading spirit. The whole "Place Hold" option is GENIUS. With one click, the book I want is reserved, pulled from the shelf, and soon my phone rings, then a nice lady tells me my book is ready to be picked up within 5 days. What a wonderful service! It's almost like a drive-through window. Only one of the books below was the result of that service though. Once I was actually there, I decided to browse just a bit. I'm looking forward to enjoying Georgette Heyer again, since The Grand Sophy was so entertaining; along with two Maisie Dobbs mysteries and a couple of others. After yesterday's SPT and an emergency trip to Hobby Lobby, I am itching to create and decorate with abandon. Well, just a little abandon. 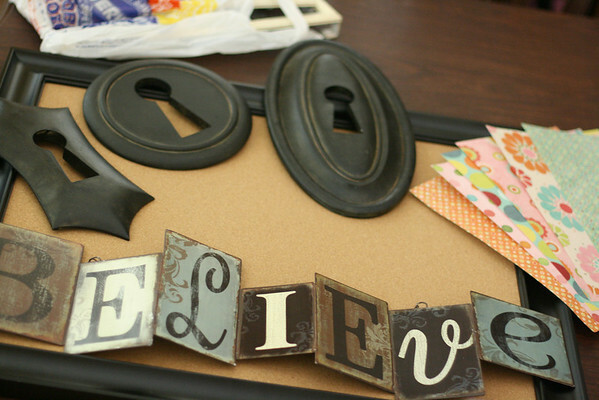 These keyhole plaques spoke to me as well as a simple black corkboard. I still need to get some fabric and ribbon to spruce that up. 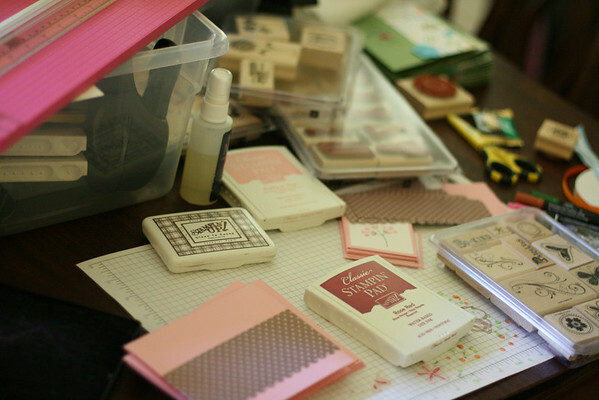 I plan to use it in my craft room as an inspiration zone. I know there is no accounting for personal taste, but I really liked this believe sign. I don't always like those mass produced sentimental objects de art telling me to Live, Laugh, Love, Simplify, etc, but...what can I say, I fell for this one. I hope we're all still friends. Now, the 12x12 paper is actually why I went into Hobby Lobby in the first place. I know. I have approximately 18 hours to make one of those cutesy Happy Birthday triangle banners. I know. Obviously no dining is taking place here. I fiddled and piddled with cards, but, alas, I got distracted. I also need to make a cake for Annelise's birthday tomorrow. She requested a spaghetti supper and chocolate cake, so I'm using a bit of creative interpretation and will make a Coca-Cola cake. Just imagine the warm, fudgey cake with Homemade Vanilla ice cream. Okay, not really homemade, it'll be Blue Bell. Speaking of birthdays, A. 's 5th to be precise, I appreciate all of your comments about my dilemma. Scott and I have stewed and brewed about it, and I probably beat that poor horse WA-A-AY down into the ground. We decided to celebrate with our family tomorrow evening, she will also take cookies for her class, and then we will have a simple--note to self: SIMPLE--party with a few of her friends at our house in a couple of weeks (more on that soon). At this very moment, I guess with all of these tasks looming over my head, I need to get busy doing them instead of blogging about them. Sigh. the keyhole plaques are so clever! and your *believe* sign is beautiful. can you start reserving books for me at MY local library? then, maybe i'll get around to reading something! Hurry up and tell us what you'll do for A's party, will ya, because Mimi's birthday is on the 20th AND I NEED TO COPY YOUR IDEA. Whatever that idea may be. I'm copying it. You're so funny. I love how you write! I love those keyhole thingys. And you're gonna have to post your recipe for coca cola cake. It must be awesome!! Good luck with all of the things on your "to-do" list. I am sure it will all work out. I can't wait to see the finished project with that believe sign. It already looks fabulous. I love your brain, Holly. I would love to see what comes out of your emergency trips to HL and Michaels. Those are wonderful places to lose oneself. Glad you enjoyed it, and it seems to have been profitable. 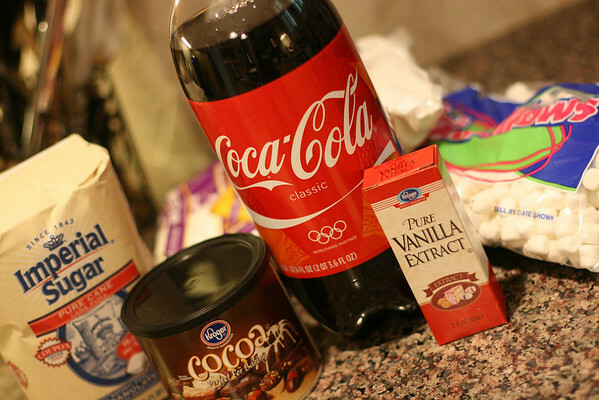 I have a recipe for Coca Cola cake, but never tried it. You are inspiring me! Oh, I wish I had as much time to read as you do. You have many great GOOD READS, but I'm slowing down on them. Enjoy the simple celebrations. It looks like act 1 was beautiful. I love the banners that are personalized. That's how she will feel special to you! I forgot to say that all of that stuff was marked 50% off at Hobby Lobby, I LOVE, love, love their sales. Of course the paper was not on sale--the cheapest thing. So far the believe sign is just sitting peacefully on top of our TV armoire. I might get more inspired at some point. TJ: I think my desire for reading more is much stronger than the actual time I find to do it. I know I'll have to recheck several in that stack at couple of times. I can't seem to only check out one or two at a time--I like to stock up! Crystal: I'll post more about A. 's upcoming party soon--but not too soon because I am a Down To The Wire type of girl. Hint: There will be Polka-Dots. I haven't stopped by in FOREVER! 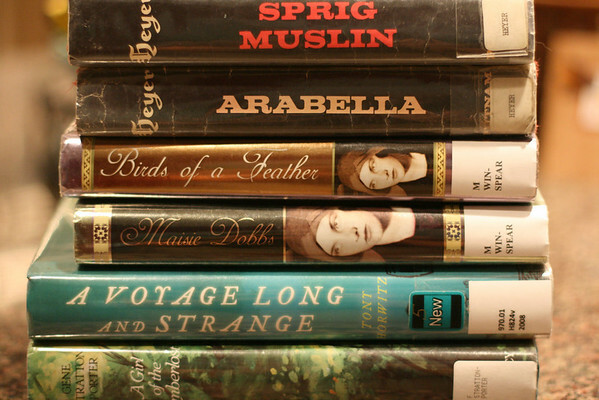 And when I did I was so happy to see your stack of books with Arabella close to the top...I knew I liked you :) Georgette Heyer is one of the greatest authors of all time and Arabella is one of my faves (have you tried Venetia--it's another good one! ).